IC 1805 is a young star cluster surrounded by Ha emitting nebulosity, located in the constellation Cassiopeia. 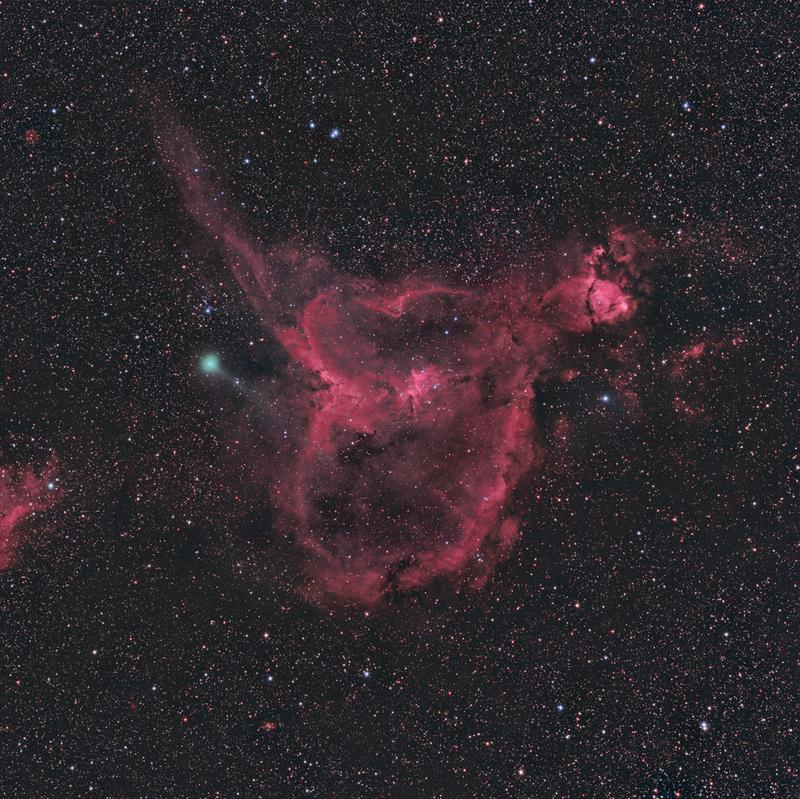 The above image shows IC 1805 accompanied by Comet Jacques, which moved through this region on 8/19 and 8/20, 2014. There is a great deal of interesting detail within IC 1805 that can be best appreciated in Ha light, as shown here in an image that I captured several years ago. More information about this region can be found at Rob Gendler's website. Exposures: IC 1805: Ha, 4 hours; RGB, total of 4 hours; Comet Jacques, LRGB total of 1.5 hours. Post-processing: Calibrated, aligned, and stacked in Maxim, followed by DDP in ImagesPlus (IP). Further processing in Photoshop CS (16 bit format). I also used the nice tutorial by Bernard Hubl for tips regarding acquiring and processing the comet.